Posted on June 15, 2018 . by Patrick Johnstone. Leave a comment. Last Council meeting, we had an update report on the replacement plans for the Canada Games Pool, and a reporting out on the results of the last round of public engagement. I mentioned it briefly in my council report, but it is a big enough story that I thought I would flesh this out with a bit more detail, and share some of my thinking on this project. 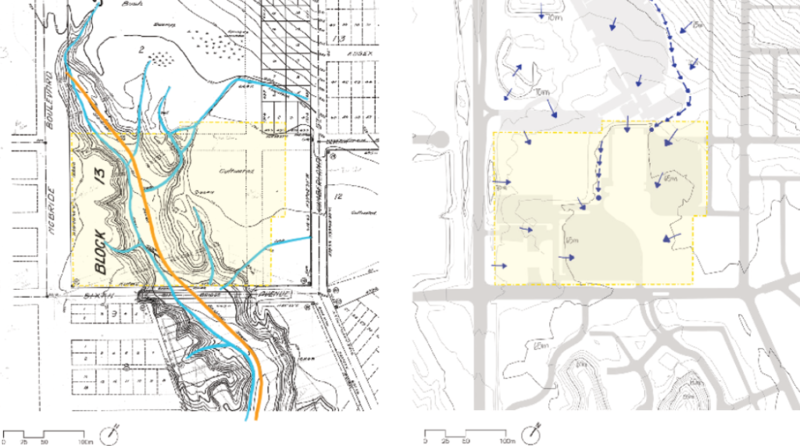 Back in the spring, the City began this round of public and stakeholder consultation on the replacement of the Canada Games Pool and Centennial Community Centre. This came after two years of meeting with stakeholders, holding a pretty comprehensive public engagement process, work with program staff at the pool, architects, geotechnical engineers, and other subject matter experts. I talked about that first-phase work more in this Blog Post I wrote earlier this year, and at that time mentioned we were ready to take a draft plan out to the public based on that work. As you may have heard, part of this engagement was a call from the Hyack Swim Club to build a more competition-oriented pool than the initial plans presented. Although the plans were developed with consultation with competitive swimming, which included a 50m pool length and a secondary pool that was amenable for warm-up and cool-down lengths, they did not feel the draft plan provided a venue that supported the level of competition their club could support. Putting the wants of this user group aside for a moment, it is clear from the engagement that the program proposed closely matches the desires of the greater community that will ultimately pay for most of the new facility. 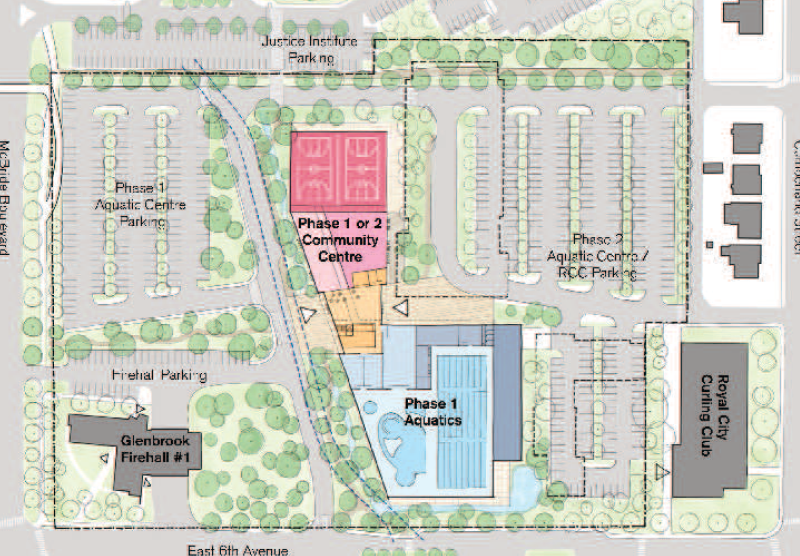 The balance of aquatics and leisure swim space, the enhanced fitness centre, community flex space and gyms, and childcare facility are all well supported (in the end, we may need more pickleball space, but I’m not sure we will ever meet that demand!). So I am satisfied that the program we have proposed is the program we need in the community, and the public engagement results reflect that. That does not mean this facility has everything everyone wants. Simply put, that was not possible, partly because we have a limited budget and buildable area on the site, partly because when you do comprehensive public engagement (see the 60 pages(!) of comments included in the report) you get a lot of contradictory requests. For everyone who wants, for example, a lazy river, there is someone who hates the concept. Parsing through this mixed data was a big task for staff, our consultant, and the taskforce. I need to emphasize that the Hyack Swim Club was involved in this process from the beginning. Several meetings were held with their board and coaching staff, and their members were encouraged to take part in the public engagement process. 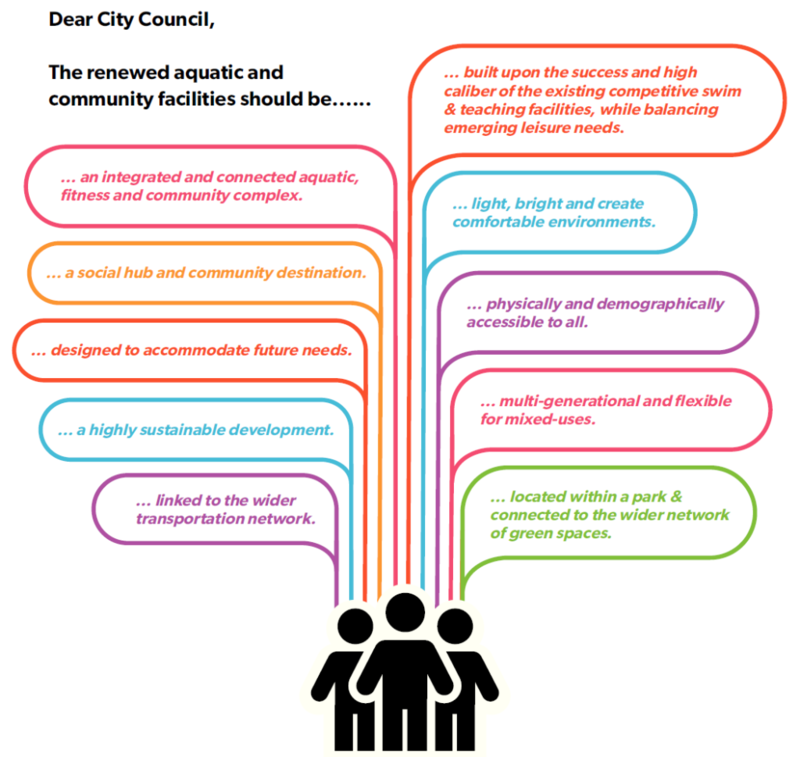 From day 1 it was recognized that the competitive swimming community valued this asset, and as a regional community they are a vocal in discussions of any new aquatics complex in the region. There was no doubt that Hyack wanted as high-level a competitive pool as possible, up to a pool that would meet all Swim Canada requirements for the highest level of competition (something that currently doesn’t exist in BC, but is best represented by the $200 Million+ Pan Am Sports Centre in Toronto), and this led to some pretty significant discussion about how far we could afford to go that way while still meeting the desires of the community for a family-friendly recreational facility, within reasonable budget expectations. The purpose of this stage of public consultation was to hear if the draft plans that came out of the planning process hit the target the community and stakeholders were looking for. In that sense, it was anticipated that some push back from some users on the draft plans would occur. I think we got there from the community viewpoint, but the stakeholder side clearly needed more work. That is why we do this kind of consultation. Competitive sports facilities are, by nature, regional. Sports programming rarely respects Municipal boundaries, and just as competitive curlers from across the region come to New West to curl at the Royal City Club and MsNWimby goes to Coquitlam to play in a women’s ice hockey league that suits her competitive level (wait – neither of those facilities are run by a City… never mind, let me continue my story here), we need to expect that all Cities will build facilities that will be used by people from outside that City. I also need to clarify that the request from the Hyack Swim Club is not just “two more lanes”, and though the swim fees paid by Hyack Swim Club are definitely a significant part of our operational revenue, they will certainly not offset the increased capital cost of a larger facility. 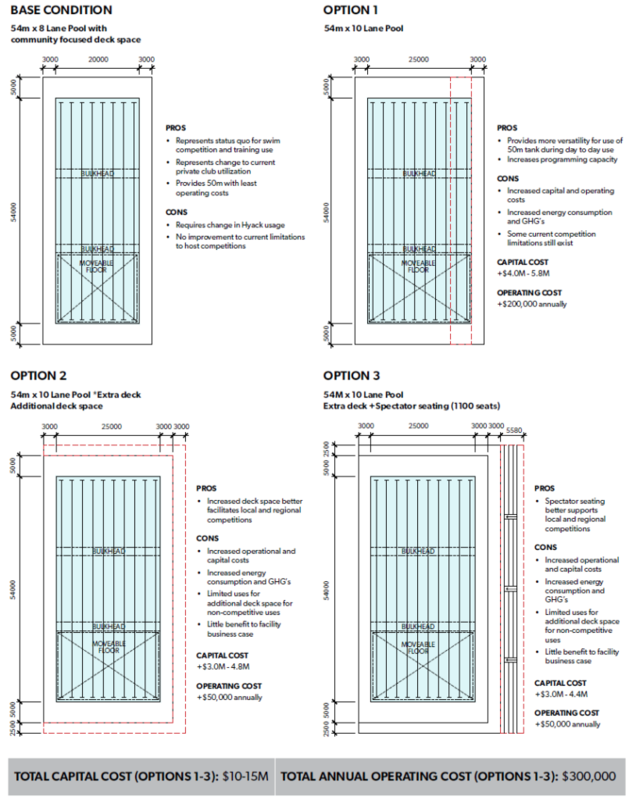 The request for two more lanes, a larger secondary pool to better accommodate warm-up and cool-down length swimming, significantly increased “wet” deck space, and some level of “dry” spectator seating represents a significant cost premium. I (speaking as one Councillor, this is, as always, not necessarily the opinion of all of Council) am not willing to compromise the community amenities that the community asked for to pay for that cost premium. Ultimately, this is a case where the public engagement is vital to decision making, and I cannot ignore the wants of the larger community when building the most expensive asset the City has ever built. That said, if we accept that higher-level competition is a regional asset, it is reasonable to expect that the region help pay for it. 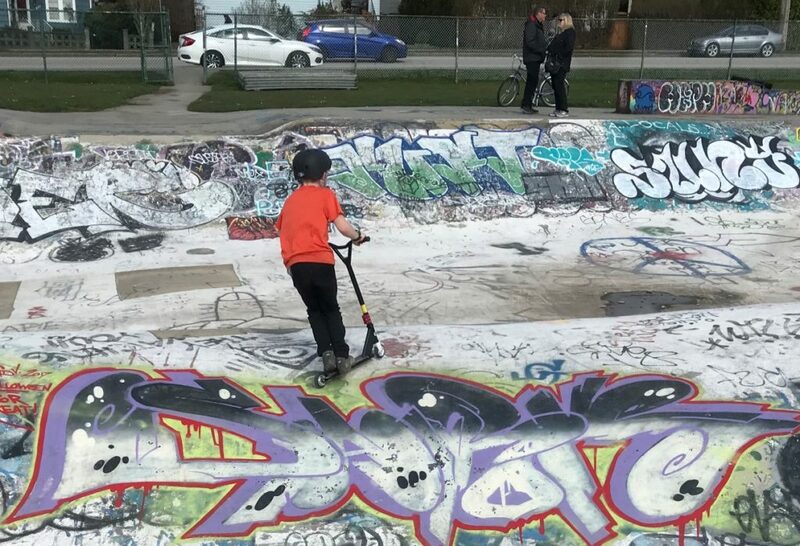 All along, the City has been working towards senior government assistance to build this facility, through the promised federal Infrastructure Grants program and affiliated provincial programs to support recreation and community assets and community reductions in greenhouse gas emissions. I think we have developed a program that will very closely meet the expected criteria for federal infrastructure funds. These, matched with provincial funds, may give us the financial space to build the expanded region-serving competitive facility, while not compromising on the recreational facility the community clearly wants, and not overly burdening our (still stretched) capital budget. So the path forward the City has chosen is to continue to work towards an expanded facility that will support higher-level competition (one the Hyack Swim Club expressed unbridled support for at their public delegation last week), and the community recreation that the public engagement outlined, and hope that senior government grants will be sufficient to make it viable. We will continue to hold the current more recreationally-focused program as a fall back in the event we are unsuccessful in receiving sufficient senior government support. The good news is that we now have a well-supported plan to move forward, and can do some of the extra work we need to do to get this project “shovel ready” enough to get those grants. To quote someone more profound than me: Now this is not the end. It is not even the beginning of the end. But it is the end of the beginning. And I’ll write one more post about this pool in the next few days (yes, I’ll get to your question, Jason), but this one is long enough for now! Posted on October 26, 2017 . by Patrick Johnstone. Leave a comment. I understand that an interim structure is going to be built in Queens park as a temporary replacement for the Arenex. Is there any idea how much this new structure will cost and how much money will remain for a future building? As well, will the cost of demolition and 24/7 security monitoring of the old site be deducted from the money received from insurance? I’m going to be a bit less definitive than usual in answering your questions, because City hasn’t made all of the decisions on this yet. This would also be a good time to explain to folks that some discussions that take place between the City and suppliers (like insurance companies, building contractors, etc.) may be protected by Section 90 of the Community Charter. Under Provincial Law, there are some types of negotiations that happen between the City and private businesses that are necessarily kept secret so as to not put the City in a poor negotiating situation, expose the City to liability, or undermine the confidence of potential suppliers. The results of these “in-camera” discussions are always made public if and when a decision is made (we cannot spend any money without including it in our publicly-released financial documents, and our procurement processes are always released), but during the negotiations, it is commonly required to keep things under wraps. By Section 90, talking about “in-camera” discussions, even providing some details about what topics were discussed “in-camera“, is illegal until those discussions are raised out of “camera”. With that caveat in mind (whats with all the Latin today?) we did make an announcement back in June (which is around the time you sent in this Ask Pat – yes, I am sorry for not getting to it until now!) that we would fast-track the building of a “temporary” structure to replace the bulk of the Arenex functions, and that building should be operational in the summer of 2018. It will be about twice the size of the Arenex, which should make it a more usable space for some of the gymnastics programs, with some leftover space that may have flexible uses. This building should cost less than the insured replacement value of the Arenex, but at this point, I can’t really provide you exact numbers around this, because I haven’t seen those numbers. An interesting point coming out of the work staff have been doing is that these “temporary” suspended steel structures have a design life of better than 20 years. They can last significantly longer with maintenance investments. The bigger advantage to us is that the site prep work is simpler than building a new “permanent” structure, and what you may lose in flexibility during the design and procurement stage, you get in efficiency of getting a building on-line. So it is possible that this “temporary” structure will provide gym spaces and other space for decades to come. The City also went through a bit of a consultation process with stakeholders and an on-line survey back in May to guide us towards permanent solutions. The main questions were around how the Arenex loss should inform our plans for a Canada Games Pool replacement. I think CGP planning after the extensive consultation completed last year is coming along well (I am on the Mayor’s CGP Task Force), and I suspect we will be in a position to make some public announcements about that program before the end of the year. By then, we will have a better understanding about what programming will go where during the CGP/Centennial Community Centre replacement works, and where things will be when the work is completed. 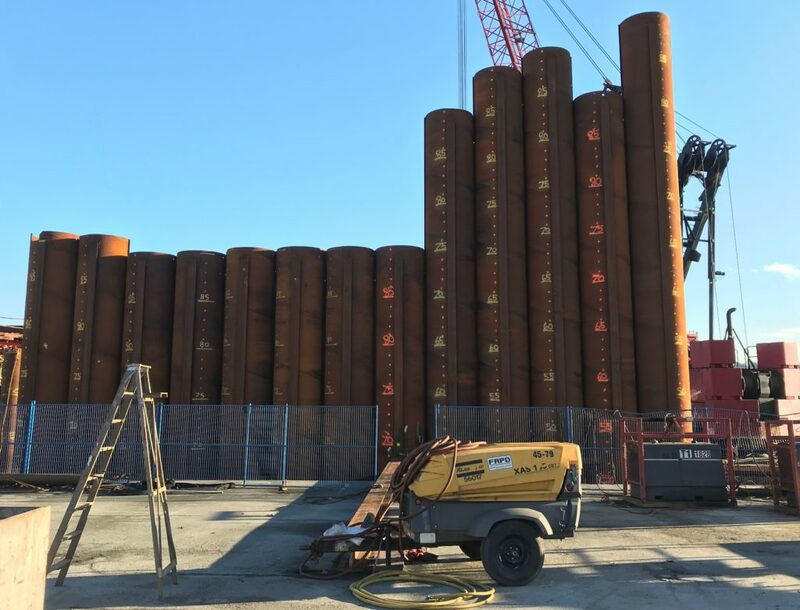 A “temporary” Arenex replacement opens up several options to maintain program continuity during the construction phase. On our last question, I can only speak in generalities, but I have learned quite a bit since this event occurred about how the City insures its major assets. Insured building replacement value (which may or not be the true cost-of-replacement of the structure) is generally separate from other line items related to loss or damage to a building like business interruption, demolition, contents, engineering reviews, liability, etc. Hence, coverage for security or demolition costs would not be deducted from the replacement cost of the building, just as ICBC would not typically deduct the cost of providing a rental car from your car’s replacement value if your car was stolen. Posted on June 11, 2016 June 10, 2016 . by Patrick Johnstone. Leave a comment. Can we do something with the giant paved lot near Westminster Pier Park (where the shipping container W is)? It’s such a waste of space. 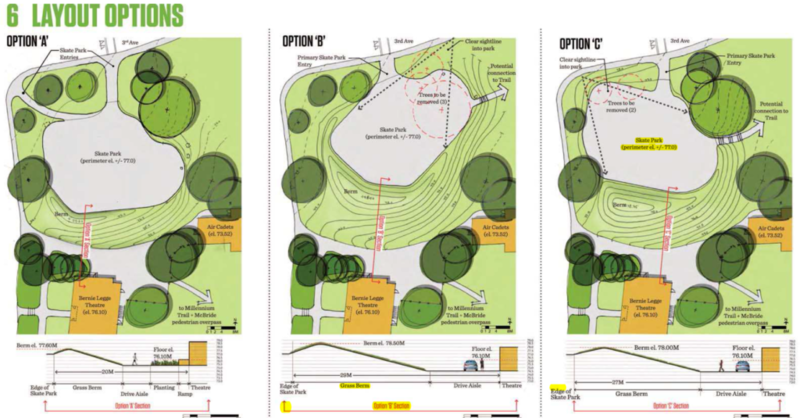 Westminster Pier Park is amazing but i think the area could really use more grass space to lay down, play some bocce, toss a football around etc…Another suggestion would be providing additional basketball court(s), tennis courts. There is a real dearth of outdoor sport facilities in the downtown area. Could this empty lot not be temporarily re-purposed into any of these things rather than just the empty black surface it is now? Love what the city has done by putting volleyball courts adjacent to that lot, but are there plans to re-purpose the other lot as well? We call that part of the park the “Timber Wharf”. My understanding of the history of the space (and this was before my time on Council) is that it was originally going to be programmed as part of the Pier Park project, but that got scaled back during the park development because of unexpected environmental remediation costs that stressed the budget, and generally unfavorable geotechnical assessments for that part of the wharf. The underpinnings are not in great shape, and are going to need some repairs and upgrades before the space is permanently programmed or anything heavy is placed on it, hence the temporary installations there now. 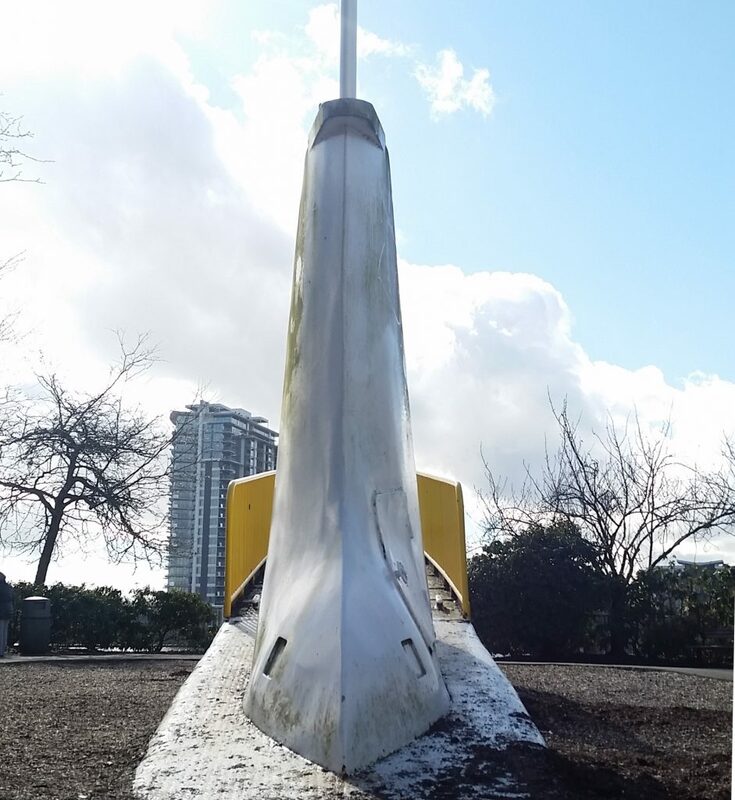 The longer-term plan is to program that space, which will make it more amenable for some of the uses you describe, but I think the priorities for spending right now are in trying to connect the park to the east to complete that part of the waterfront connection to Sapperton Landing and the Brunette River. The capital cost of upgrading the timber wharf isn’t in the budget right now, so I suspect the “permanent” fix is going to have to wait a few years. In the shorter term, I would love to hear suggestions about temporary programming. 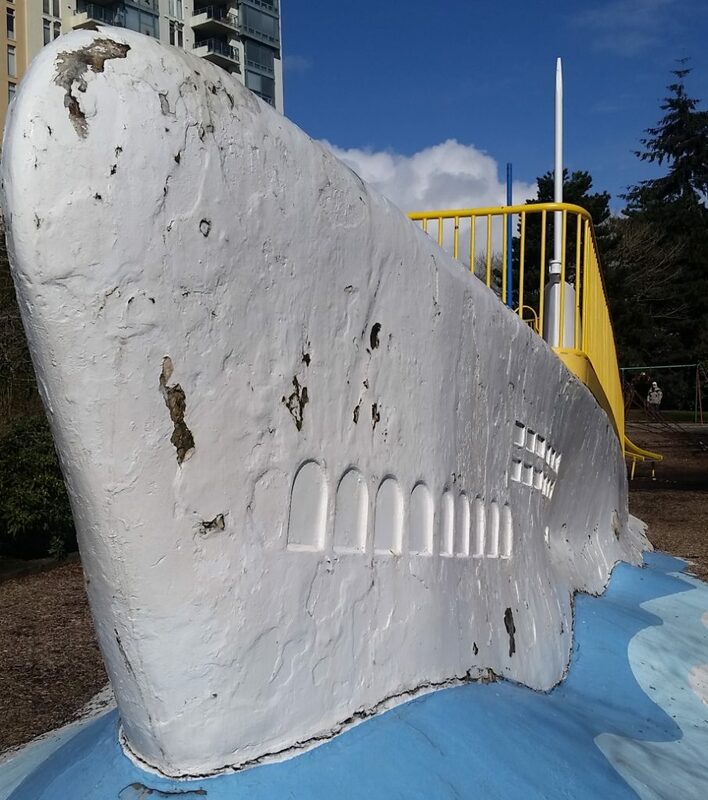 We are pretty limited in regards to installing anything of significant mass (the engineering hassles with WOW New West were… substantial), and are even unlikely to be able to smooth the asphalt surface much, but paint and temporary installations are possible if we can find a bit of room the Parks budget. This also gives me a chance to promote two cool things going on in that area in the very short term – like right now!. Through a partnership with Live 5-2-1-0, Kids New West, Fraser Health, and School District 40, a Play box is being installed at the Timber Wharf. This is a box full of toys, balls, and outdoor games to help kids get active and have fun in the relatively un-programmed space. It is free to use, and will be opened every morning and re-secured at night. This is the first time this public playbox program has come to New West, although it has been successful in a few other nearby municipalities. If you have kids, take them down and see what may emerge! Posted on February 10, 2016 . by Patrick Johnstone. Leave a comment. Hi Pat, I am just inquiring about Sullivan Park on Oliver Street here in the Queen’s Park neighbourhood. It is a lovely park and really close to our home. However, I am noticing that there is a lot of dog dropping being left all around the park. I am not sure if this particular park is monitored but something needs to be done. It is horrible. I refuse to take my 14 month old there anymore as I am worried he is going to fall into it.. or worse. Anything you can do for us? Shh! I didn’t think we were allowed to talk about Sullivan Park. It’s one of those neighbourhood secrets that we aren’t supposed to let anyone know about. One general rule about a persistent dog-crap problem in a location is that it is probably just one person. Most dog owners are responsible and don’t want crap lying around any more than the rest of us, but one or two bad apples definitely can result in a lot of… uh… road apples. Unfortunately, catching that one person is probably near impossible. My first suggestion is to use SeeClickFix when you run into a problem like this, to make sure it gets onto the City operations radar. If you aren’t a smart-phone lover, you can use this on-line form to make sure your issue gets tracked and followed up on. Or call Parks, Culture and Recreation at 604-527-4567. What can Parks do? That is definitely a small park, and we have limited staff, so 24-hour patrols are not likely in the offing. I am not as familiar with Sullivan Park as my Queens Park neighbours, but having a doggie station with a ready source of collection bags, trash receptacle and signage will usually help most people do the right thing – if the park doesn’t have these at the one or two most common entry point, that may help. Of course, it may also encourage more people to see Sullivan as an unofficial “dog run”, which comes with its own issues. As it is a unique spot, with a relatively small group of users (until you went and let the secret out! 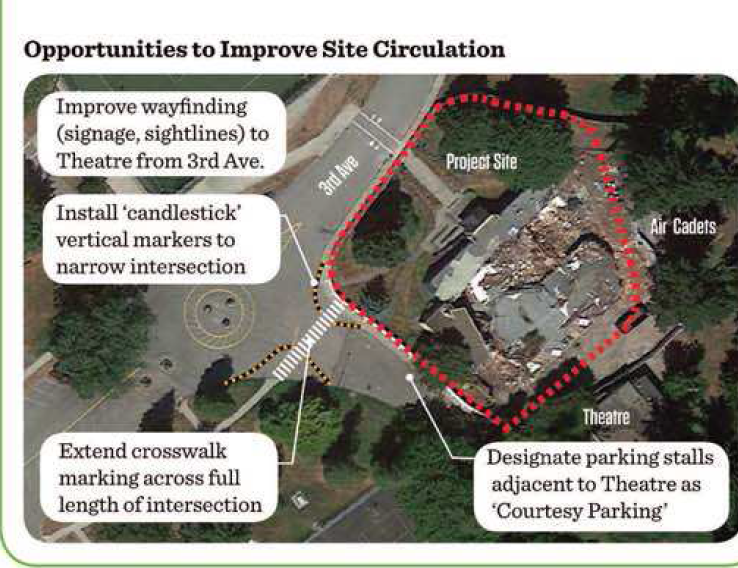 ), it might be interesting to see if the neighbourhood has any ideas how to approach the issue. Better signage? Neighbourhood dog-watch? As a non-dog owner, I’m happy to hear suggestions!